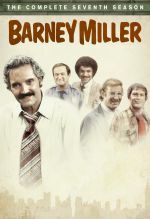 Barney Miller - The Complete Series was released on October 25, 2011! 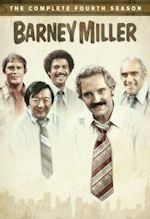 Airing on ABC primetime from 1974-1982 and seen by millions, Barney Miller is a situation comedy television series set in a NYC police station in Greenwich Village. 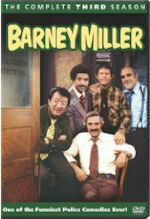 Captain Barney Miller is the kind of cop we'd all like to meet. He somehow manages to maintain order over a group of inner-city detectives who gamble for a hobby, get hit on by anything in skirts, go to renaissance philosophy conventions for fun, and would really prefer to be writing. 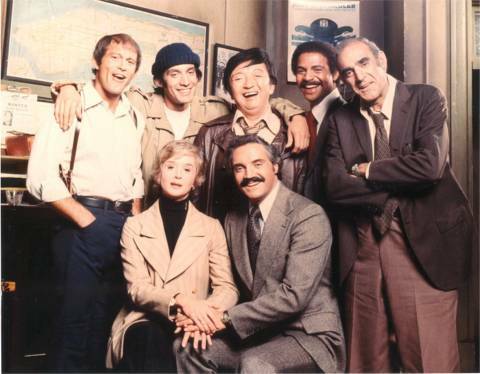 These colorful characters worked together to make one of the funniest sitcoms ever and is cemented in classic TV status. 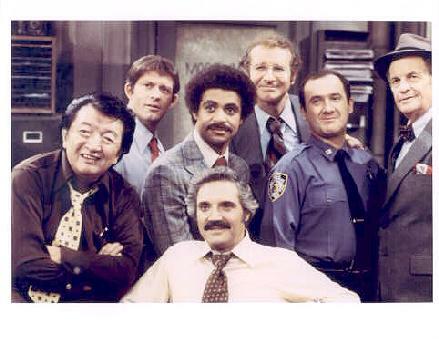 Stars: Hal Linden, Abe Vigoda, Jack Soo, Steve Landesberg, Ron Glass, and Max Gail. * Note: In one episode he actually spelled it out, holding up his name plate and pointing to the letters, then added at the end "just like it sounds". Many tv reference books spell it Wojohowicz which I guess is incorrect based on that particular episode. 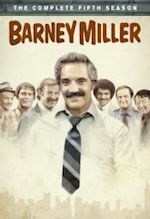 Barney Miller grew out of a rejected comedy pilot called "The Life and Times of Captain Barney Miller," which aired as part of an ABC summer anthology called Just for Laughs in 1974. In that pilot the action revolved equally around Barney's problems at the police precinct house and his home life, with his wife Elizabeth and kids prominently featured. 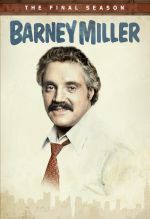 But when Barney Miller made it to the regular ABC schedule the following January, the family played a much smaller role (eventually they were written out) and the locale became the Greenwich Village station house where Barney and his motley crew spent their day. 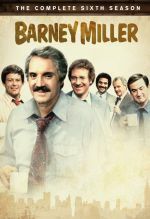 Three actors besides Hal Linden came over from the pilot to the series: Barney's two kids, David and Rachael, who soon disappeared, and a broken-down old cop named Fish. Fish was the hit of the show. Not only did he look incredible, he sounded and acted like every breath might be his last. Fish was always on the verge of retirement, and his worst day was when the station house toilet broke down. He was constantly complaining about everything, especially his seldom-seen wife Bernice. There were ironies in Abe Vigoda's portrayal of Fish. Vigoda, 54, was in real life an active athlete (he jogged and played handball), and the role for which he was previously best known was quite different indeed--that of the ruthless Mafia leader Tessio, in The Godfather. 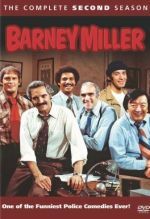 Vigoda became so popular that he eventually got his own series, Fish, though he also continued on Barney Miller for a time. He left the series ("retiring" from the police force) in September 1977. Others around the 12th Precinct station house were Det. Amenguale, the Puerto Rican; Wojo, the naive, trusting one; Yemana, the philosophical one who made coffee for them all; Dietrich, the know-it-all; and Harris, the wisecracking, ambitious black. Seen occasionally were Inspector Luger, the sometimes incoherent superior; Levitt, the 5'3" uniformed officer who wanted to be a detective, but was "too short"; Lt. Scanlon of Internal Affairs; and female officers Wentworth and Baptista. A continuous parade of crazies, crooks, con men, hookers, juvenille muggers, and other street denizens passed through. 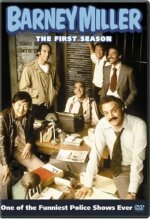 Among the notable events of later seasons were Harris's emergence as a published author, with a lurid novel about police work called Blood on the Badge; and, in January 1979, the death of actor Jack Soo. Soo was last seen as Yemana in October 1978, but was so loved that a special episode was devoted to him the following May, with clips from past shows and reminiscences by the cast. At the end they all raised their coffee cups in a poignant farewell toast. As the series declined in audience share during 1981-1982, the producers decided to end its run with an ironic twist. The discovery of an antique gun in the precinct house revealed that the building had been the headquarters of Teddy Roosevelt when he was president of the New York Police Board in the 1890s. In fact, Barney's office may have been President Roosevelt's office. As a result, the building was declared a historic landmark and the precinct forced to vacate. 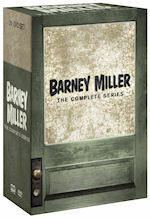 In the last episode, Barney received the long-awaited phone call from headquarters. The news was bittersweet: Barney was promoted to deputy inspector and Levitt had finally made sergeant; but the men of the precinct would be scattered to different locations throughout the city. The 12th was no more. Both 'Steve Landesberg' and Ron Carey guest-starred as felons before joining the regular cast. One of the props used on the police station set was a chalk board the cops used to show whether they were on duty or off duty. When show ended, the chalk board was donated to Smithsonian Television Museum. The episodes were orginally taped before a live audience. This element of the show was eliminated in later episodes. The producers were approached during the run of the series about doing a feature film based on the show using the regular cast members. The film was never made. Several references to the Broadway play and film "Flower Drum Song" were used in connection with Jack Soo's character Det. Nick Yemana. Jack Soo played Samuel Adams "Sammy" Fong in both the play (on Broadway) and the subsequent film. visitors since this page was established on July 21st, 2000.